On May 31, 2012 twenty-five high school F.I.R.S.T. (For Inspiration and Recognitions in Science and Technology) Robotics Competition students along with staff members of Tennessee High visited Strongwell. 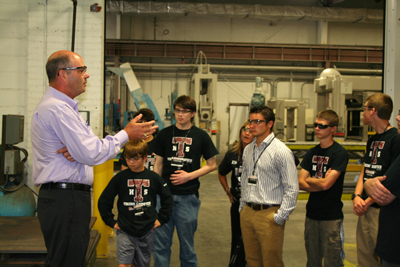 These future engineers were invited by Strongwell to understand the roles of science, technology, programming and math in the complex day to day manufacturing operations of fiberglass composites. They were introduced to the heavy reliance on designers and interdisciplinary engineers in the research and development arena of FRP products in a globalized economy. During their visit Mr. Spike Tickle, one of Strongwell’s owners (shown here), illustrated the high strength, lightweight, easy to install, non-corrosive, durability, and non-conductive nature of FRP products vs. traditional materials. These students were also introduced to Strongwell’s engineering, manufacturing and quality team, (David Gibbs, Joe Spanovich, Carrie White, Josh McCroskey, Jeff Chandler, Chris Green, and Dan Witcher) and Marketing gurus (David Ring, Kelly Barnette and Te-kai Shu). Deidre Pendley (Tennessee High Program Assistant) led a presentation illustrating their successes and struggles in producing and marketing a premiere robotics program in the tri-cities region, which placed 15th overall out of 54 teams from North America. Strongwell has always been an eager advocate of promoting FRP education to our future designers and engineers in our local schools. We look forward to mentoring and assisting our local robotics team with design, engineering and marketing resources. Many thanks to Tennessee High’s F.I.R.S.T. robotics competition team for visiting us!